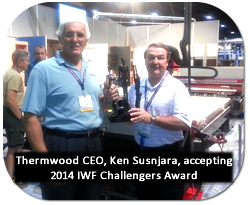 Thermwood Cut Center Wins IWF Challengers Award! The all-new Thermwood Cut Center (which makes virtually everything a cabinet shop needs, with no programming) was just announced as a winner of a 2014 IWF Challengers Award. These awards were given to seven entrants out of a field of over 60 innovative new products. Try out the all-new cut center at IWF 2014! You have the opportunity to see just how easy it is to run this new machine - right now, during IWF 2014. We'll be demonstrating live during the show, and you can be part of it by helping to operate the cut center. Please visit our booth (#5513) and speak to a Thermwood representative to get your hands on this exciting machine! What can the cut ready cut center make? 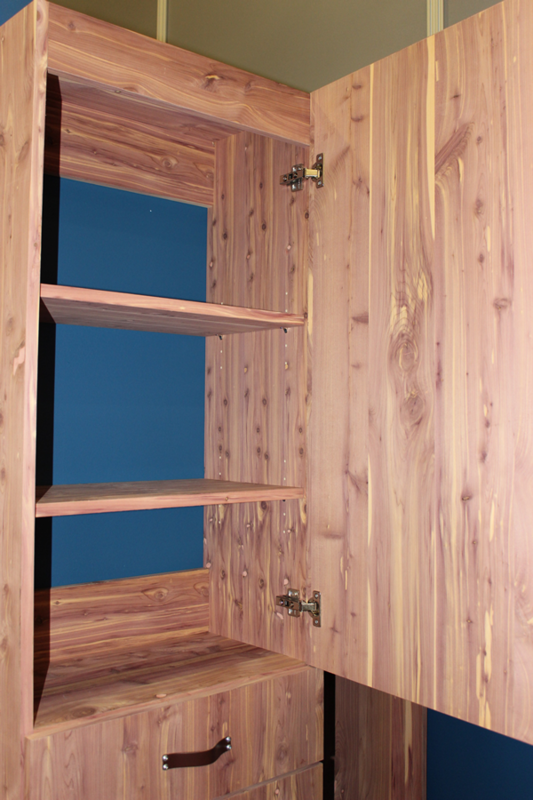 This is a set of closet cabinets in aromatic cedar plywood. These feature grain matched slab door and drawer stacks. They use “slot slide” drawers eliminating the need for hardware slides. 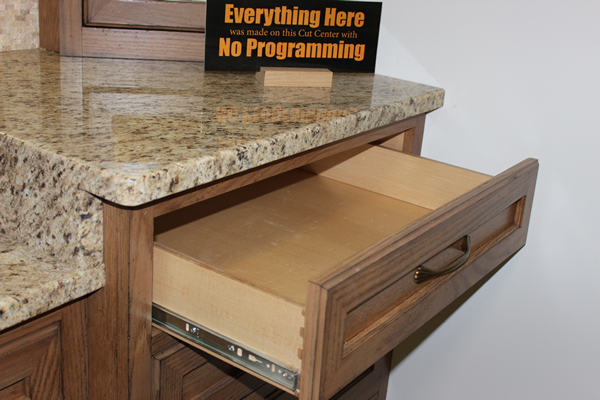 They also use our proprietary drawer stop system. 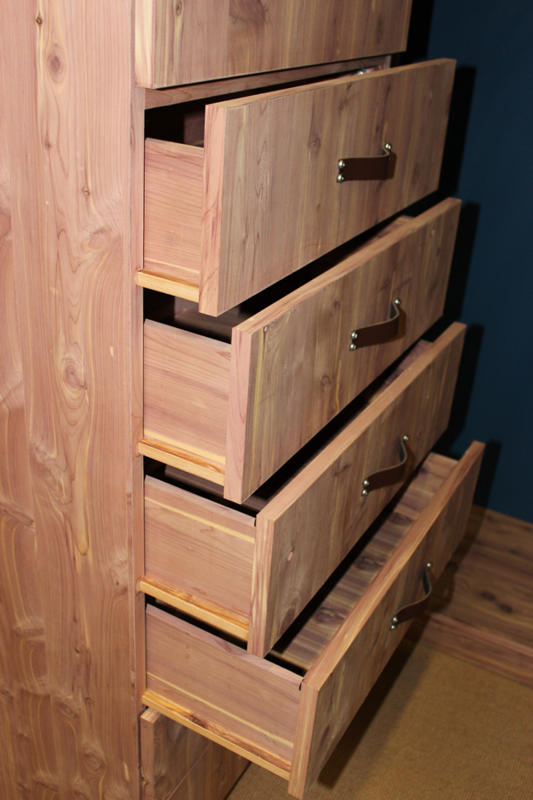 Drawers are “Blind Dado” construction with edge banded drawer sides. Cabinetmakers who have worked with aromatic cedar in the past will likely ask where we got the matching edge banding. This particular cedar is highly figured with lots of knots which make it brittle and difficult to work with so it is generally not available commercially. Western and Eastern red cedar are a poor match. We made our own aromatic cedar edge banding from a paper backed cedar veneer. The sheet was 4’ x 10’ and we cut it into 7/8” strips which we ran through the edge bander. The paper backing kept it from breaking. The system and routine we used is not currently in the machine but we plan to add it shortly. The fine tip tool we used is already one of the standard tools so this system will allow folks to make perfectly matching edge banding for about any material. 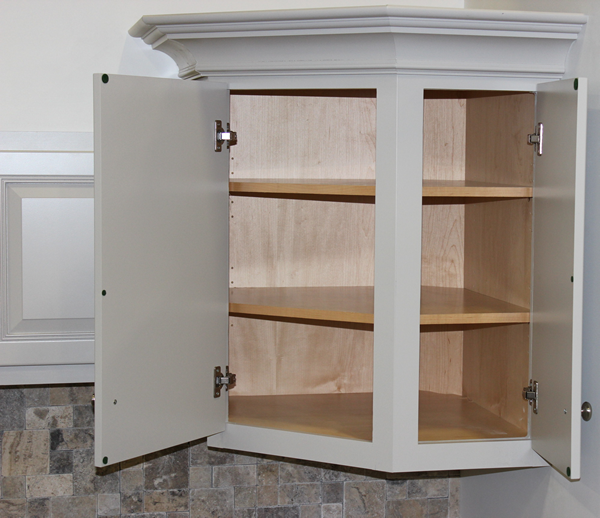 These cabinets are assembled using lock joints and cam-lock fasteners. This assembly method is ideal when the cabinet must be assembled inside the closet. Often, you cannot physically move an assembled closet cabinet into a confined closet area and you must assemble the unit inside the closet. Lock joints are the easiest way to do this although we also offer lock joints with pocket screws fasteners. 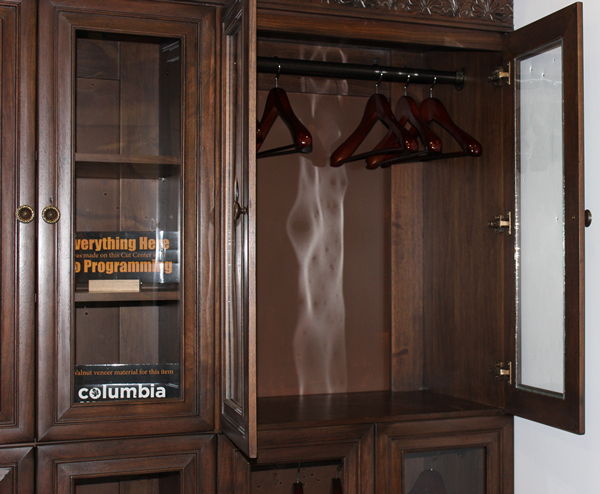 Also, these closet cabinets have detailed, step-by-step assembly instructions that you can print right at the machine. Items with lock joints must be assembled in a fixed sequence. The instructions make this much easier. 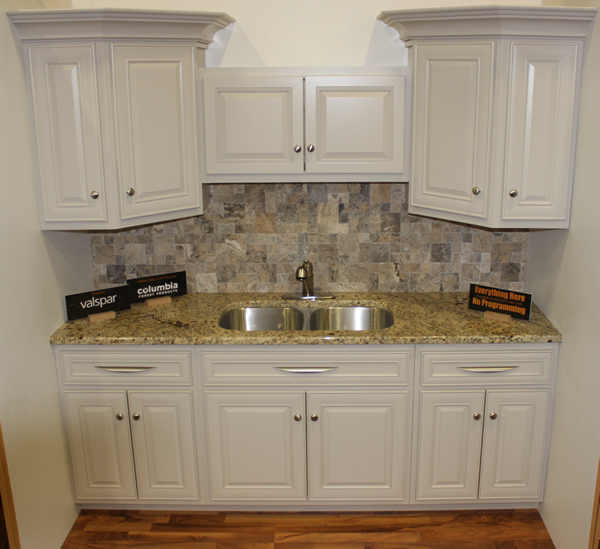 This one features upper corner pantry cabinets and a sink base in the center. This is also a face frame design using style 2, which has a mid-rail only under the top drawer. MDF doors and drawer fronts are mounted using traditional partial overlay with a half inch overlay on face frames. Drawers are dovetail construction with half inch thick sides and bottom. They are mounted on Blum undermount, soft-close slides. 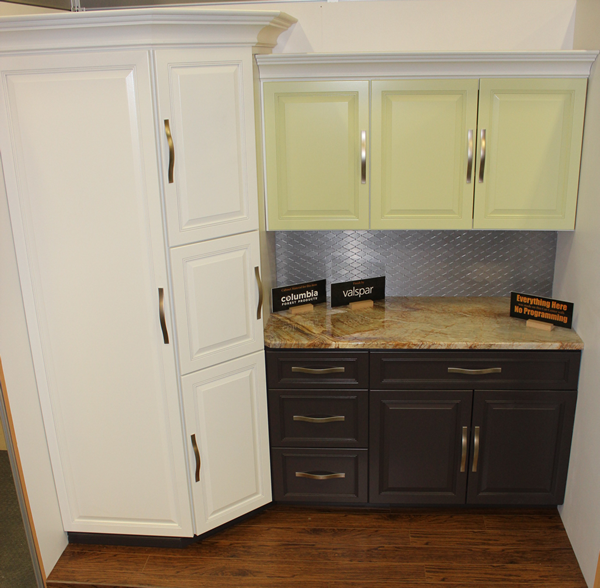 This display features a tall corner pantry cabinet with connected base and uppers. 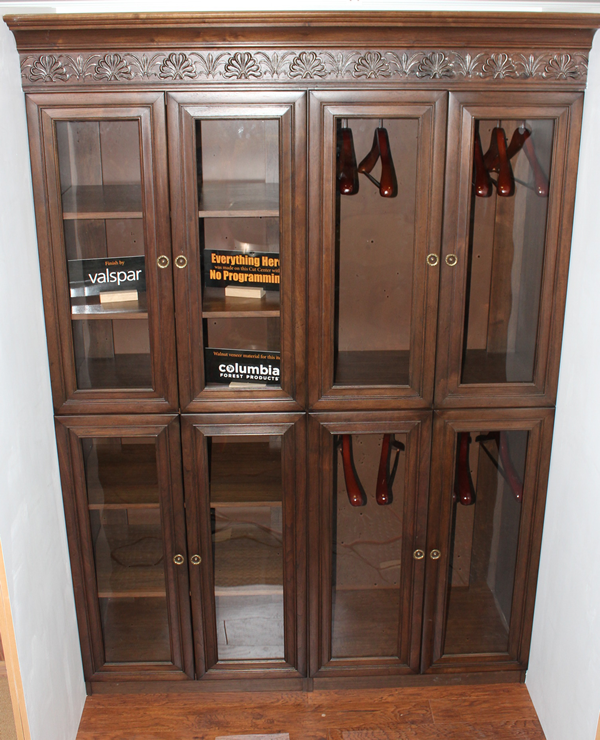 Cabinets are “open frame” (Style 1), face frame designs made using ½ inch single side material. There are no mid-stiles or rails. The corner pantry features right hinged upper and lower angled corner doors and a left hinged appliance garage door for storing kitchen appliances. 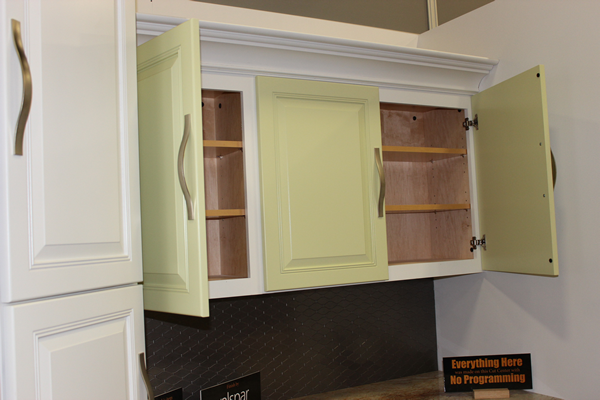 The left hinged door makes it easier to move appliances from storage to the counter top. It also features a full side door on the left end, increasing accessibility to a huge amount of storage space. For the cabinet, ½” Columbia Pure-Bond maple veneer was used which was clear coated with a pre-cat lacquer on one side prior to cutting. 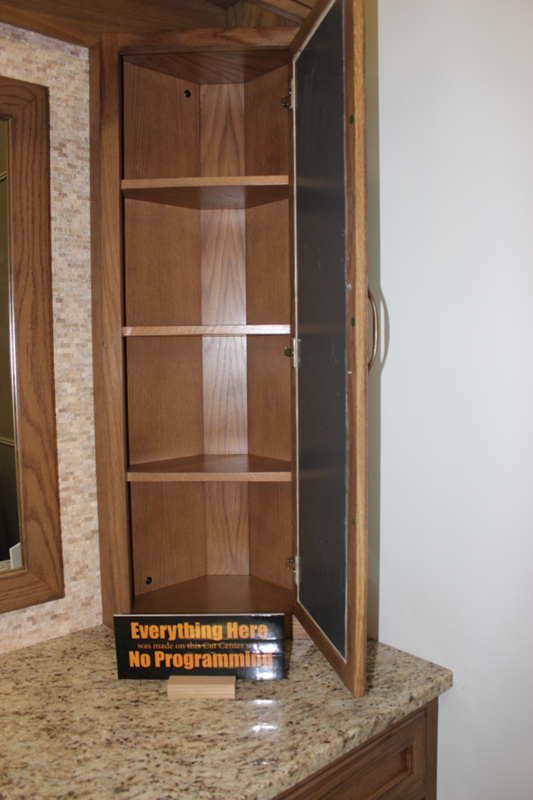 The shelves are made from ¾” Columbia pre-finished Pure-Bond plywood edge banded with pre-finished edge banding. 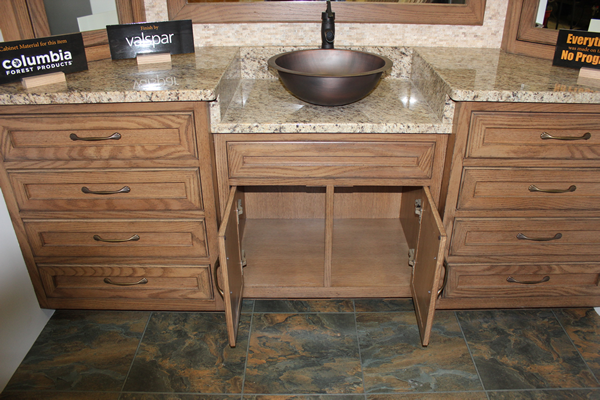 The base cabinets feature a three drawer stack and a double door/drawer cabinet. 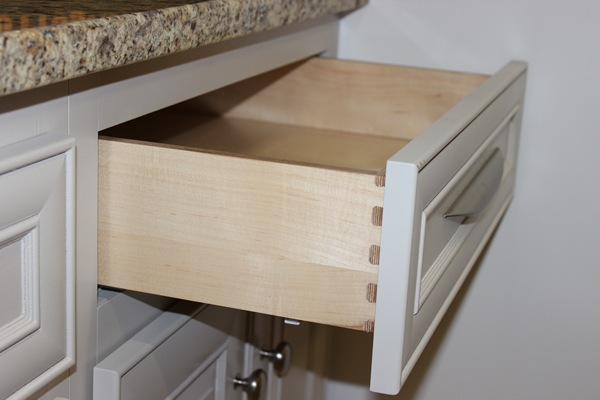 Drawers are dovetail construction with a ¼ inch slide in bottom mounted on undermount Blum Tandem soft close slides. The machine automatically sizes drawers for the undermount slides which come in three inch increments. This is important because these slides only work with fixed depth drawers. Width measurements are from the inside of the drawer to the cabinet sides rather than from the outside, as with side mount slides. This means the width of the drawer must be adjusted for any variation in material thickness, which is all done automatically. Doors and drawer fronts are MDF from the “Applied Molding” area. They are sized and mounted as “Full Overlay” meaning they cover most of the face frame and present a frameless “Euro” look on a face frame cabinet. This style is becoming popular in the US today. 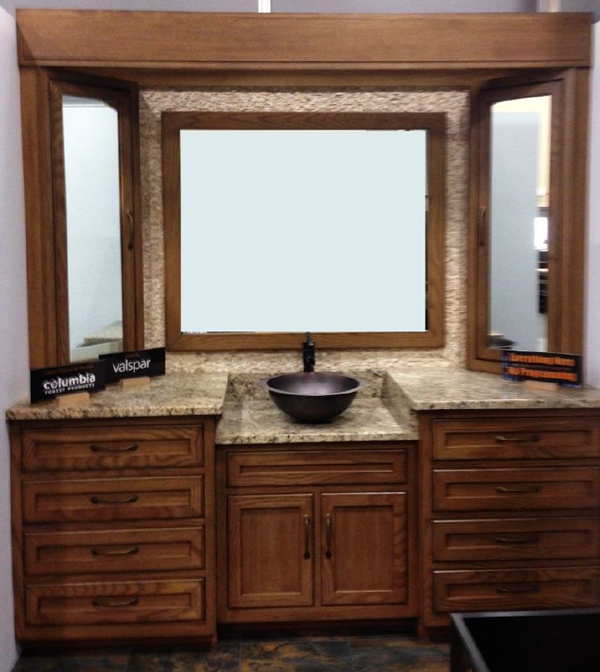 This is a set of bath face frame cabinets that show both the 30” height and 35” height cabinets available in the cut center. They also demonstrate how you can modify the standard face frame structure. Standard Cut Ready face frames have 1.5” wide stiles and 2” rails. 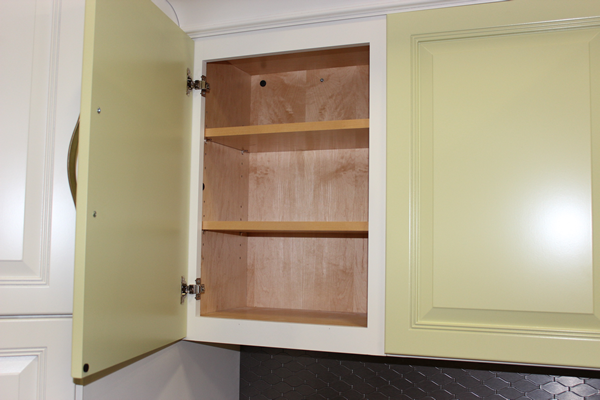 These cabinets use the standard 1.5” stiles but reduce the width of the rails so we can install inset drawers. The top rail was made at 1.5” instead of 2” and the mid-rails are 1” instead of 2”. The 48 inch high counter top mounted corner cabinets are topped by a shelf from the same area, resized to act as a top cap. The mirror frame was made using the same molding shape as the doors and drawer fronts but sized wider when made in the molding area. 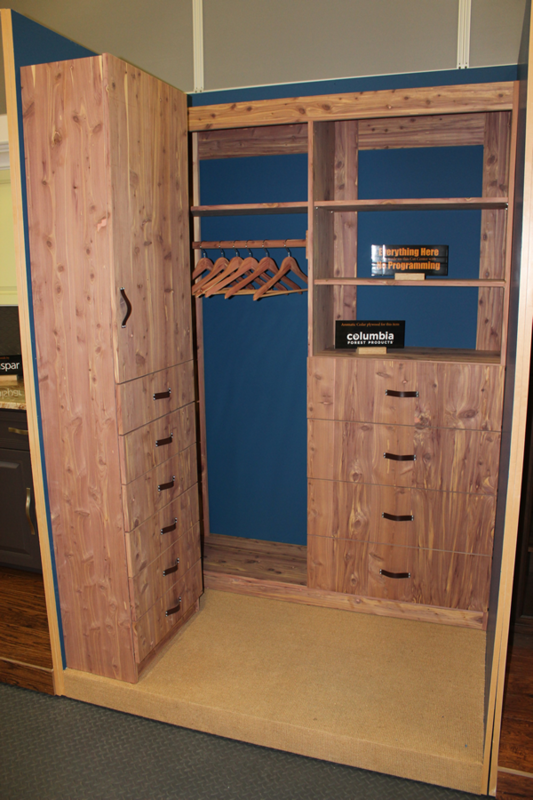 This is a walnut closet based on the frameless closet designs available in the cut center. Although essentially the same as the previous display, appearance is dramatically different, demonstrating the variety of products that can be made from the core designs. It is also cam lock construction although pocket screw construction could also work since the unit must be assembled and finished before it is installed. The solid wood doors were made from moldings cut on the machine. Several molding shapes from MDF applied moldings doors are available in the “Mid-molding” sections of “Moldings” making mitered wood doors possible. The wavy restoration glass in the doors add an “antique” appearance. The walnut carving along the top as well as the crown molding were both cut on the machine and are both part of the current offering. The carving takes almost five hours to cut but adds a unique, “expensive” look that demands a premium price. The design can also be made without the carving. Note: carving and molding material such as walnut or oak is quite difficult because of the tendency of these materials to tear out during machining. The machine allows for this tendency and creates rather nice results as you can see here. The all-new Cut Ready Cut Center is on display and cutting live at IWF 2014 in Booth #5513 at the Georgia World Congress Center - Atlanta, GA. Make plans now to visit us and see this exciting new technology in person! 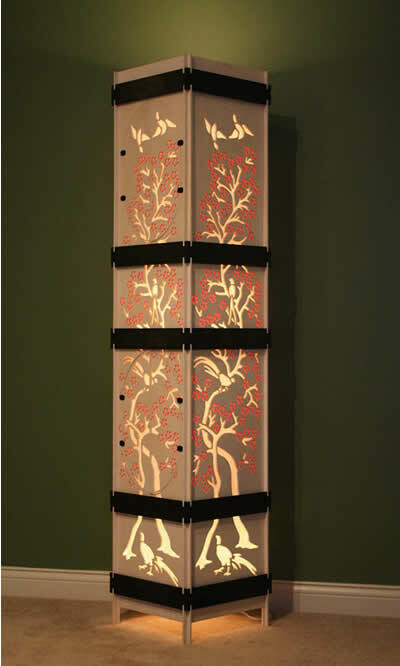 Leah Kenttamaa Squires, a student at Purdue University, West Lafayette, recently received a First Place Award for her entry SAKURA HANA in Fresh Wood, a national competition for woodworking projects sponsored by the Association of Woodworking and Furnishings Suppliers (AWFS). 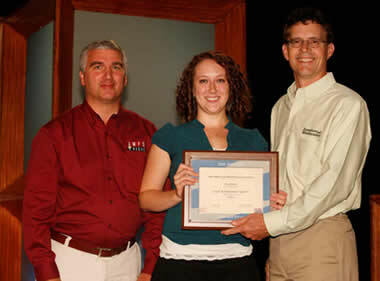 Judges Dan Hershberger, AWFS Board Member, left) and Randy Johnson, editor, American Woodworker (right) presented Kentamaa-Squires with her award at AWFS Fair 2009, in Las Vegas, NV. Leah Kenttamaa-Squires created this award-winning piece in a class Furniture Design for CNC Manufacturing in Fall of 2008, under the leadership of professors R. Gazo, E. Haviarova, R. Paul and Wood Research Laboratory technician D. Warner. The course is a joint effort between the Department of Forestry and Natural Resources and the School of Visual and Performing Arts. The 50 finalists were chosen from 169 entries from 49 different schools in North America. Hongtao Zhou a former Purdue student who graduated in 2008 from the same program and now teaches design at University of Wisconsin in Madison received an Honorable Mention at the same competition.